Adding a complimentary sauce to a dish elevates it from plain to delightful in no time flat! Sauces have long played a critical role in cuisine and they are one aspect of culinary training that remains a strong focus. From French tradition, there are five basic sauces, called “mother sauces,” each of which can be developed further into numerous variations, called “small sauces”. As oftentimes depicted in contemporary movies and TV programs, culinary students are customarily required to memorize and perfect the production of the mother sauces and several small sauces. While still used in many restaurants today, traditional mother and small sauces, which are somewhat time-consuming, are not as often prepared in home kitchens. Instead, simpler, easily customizable versions fill the gap. With a few ingredients and a saute pan, a delicious sauce can be prepared to serve with poultry, fish and seafood, pork, pasta, grains, and vegetables. In a large saute pan, heat the wine, stock, shallots, thyme and mustard over medium-high heat. Whisk to combine thoroughly. Bring to a steady simmer and cook until reduced to about 1/3 cup so that liquid concentrates and lightly coats the back of a wooden spoon. Add the butter and swirl in to combine. Taste and add a small amount of salt and pepper, if desired. Even though this basic sauce is easy to prepare right before serving, it can be prepared ahead. Refrigerate it for up to three (3) days, or freeze it for up to one (1) month. If using cream in sauces, it is best to add it when reheating the sauce just before serving as it does not freeze well. 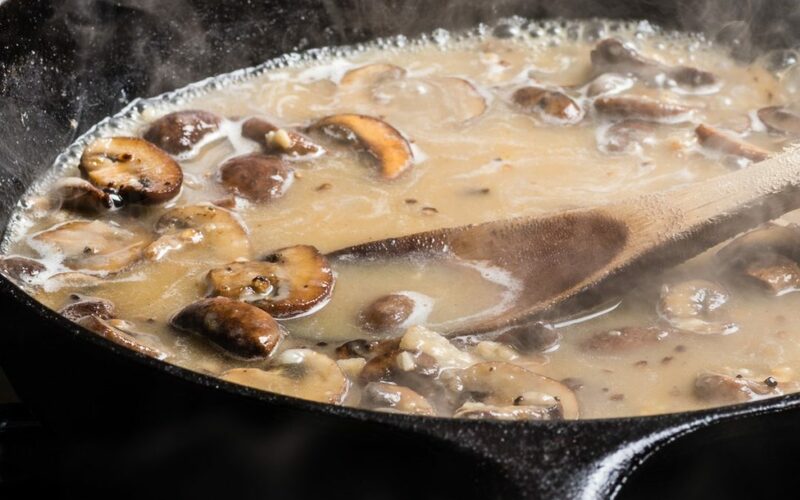 With a few ingredients and a saute pan, you can easily whip up a delicious white wine sauce to serve with poultry, fish and seafood, pork, pasta, grains, and vegetables.